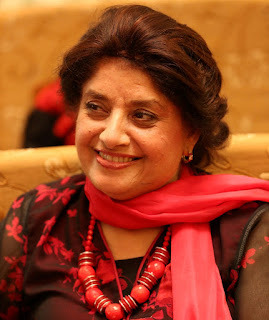 Nigar Nazar (born 1953) is the first Pakistani female cartoonist. Her character Gogi is an urban Pakistani woman struggling with her frailties in the context of sexist social norms. She is the chief executive officer of Gogi Studios. Between 2002 and 2003, she was a Fulbright Professor at the art department of the University of Oregon. Nigar changed her degree from medical to fine arts in 1971. Her cartoon Gogi appeared for the first time that year in Karachi's Institute of Arts and Crafts annual magazine. She graduated in fine arts from the University of the Punjab, Lahore. She also attended courses at the Australian National University, Canberra. In 2002–2003, she was a Fulbright student at University of Oregon art department, and in 2009, she was a Fulbright Visiting Specialist at Colorado College. She attended a UNICEF-sponsored training session on animated film at Hanna-Barbera Studios in Manila. She is the chief executive officer of Gogi Studios. Gogi Studios works on projects that actively address social issues. In 2009, Nazar completed five "awareness comics". Three books compiling her cartoons have been published, as well as several calendars, brochures, diaries, and posters. In collaboration with non-governmental organisationss, 12 public-transport buses were wrapped with Gogi cartoons in 2004 to convey social messages. She has produced several books for children on health and hygiene, the environment, disaster management, first aid, and safety, all published and distributed by the government of Pakistan. Now living in Islamabad, Nazar says, "My work ... started from newspaper and reached the community, as it appeared on public buses and hospitals. I published books and comics, I teach programs now." She is a founding member of the Asian Youth Association for Animators and Cartoonists, headquartered in Guiyang, China. She has been an official speaker and jury member of numerous art and cartoon competitions, both international and national such as the APACA (AYAAC), Aydin Dogan Vakfi (Turkey), Himal Cartoon Conference (Nepal), Cartoonists Congress (Malaysia/Singapore), and the Oxfam Congress for Women's Issues (Sri Lanka). Nazar has conducted many workshops and outreach programs to privileged and underprivileged students in Pakistan. Nazar's main cartoon character, Gogi, has been a popular comicstrip in newspapers worldwide. Gogi depicts a modern Pakistani Muslim woman with short hair, long eyelashes and a polka dot dress. Asked in an interview to describe Gogi, Nazar said, "In the words of a university student who has done a well-researched thesis on my work, 'Gogi is the symbol of womanhood in Pakistan, with all her adventures and escapades in daily life.'" The Denver Post described Gogi as "a bit like 'Blondie' and a bit like Oprah—except devoutly Muslim". Nigar was featured in the Wateen Telecom Pakistan "Icon 2010 of Pakistan" calendar. The Cartoonists Rights Network named her first among innovative users of cartoons. She received the Mohtarma Fatima Jinnah Award from the government of Pakistan. She received the Booruker UNESCO prize in 1997 for her work at an orphanage in Kyrgyzstan. She was nominated by BBC as one of the 100 Global women in who made a difference in 2014. Puppet Show for Trauma Counseling of Earthquake Victims, (October 2005) Using puppets from the Gogi comic strip characters, trauma counselling was given to earthquake victims in the form of a puppet show. Nazar conducted outreach programs in Islamabad, Rawalpindi and Lahore on environmental subjects. She showed animated cartoons, demonstrated the art of drawing cartoons, interacted with children, and distributed free Gogi books and stationary in Gogi school bags to the attendees. Nazar conducted numerous cartooning workshops for children, especially those from disadvantaged communities, with the international non-governmental organisations PLAN, HEC (Higher Education Commission), National Government/CARE and Shaj-re-Ilm. Workshops were also organised with private organisations, such as KFC, for children. Glad to Meetcha Gogi, Adam Publishers (Malta), 1975. Gogi on the Go, Pak-American Publishers, 1982. Koorey ka Jin (English: The Garbage Monster),including a board game, 2005. Prepared training modules for HIV/AIDS, for UNICEF, 2005. Designed and authored a baby-record book published by Ferozsons Laboratories in 2006. Prepared and illustrated two books on disaster management in 2006 (a JICA project). Collection of comic strips Going Gogi published in 2009; later translated to Urdu. January 2010: produced five comic books on life skills: girls' education, corruption, anti-recruitment, women's rights, and sectarian violence.